Constructed of high-quality 18.8 stainless steel with a copper capsulated bottom, the Chef's Secret(R) 2.6 liter Gloss Black Stainless Steel Tea Kettle is designed for quick, even heating. The black gloss exterior finish blends well with any kitchen d'cor, and is accented with a black handle and stainless steel cap with black knob. The 2.6 liter (11 cup) capacity will heat enough water for a crowd in mere minutes, and whistle to alert when the water is boiling. White box. 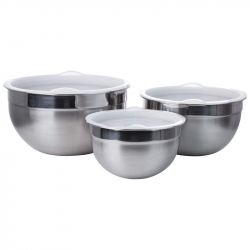 6pc stainless steel mixing bowl set. Satin finished stainless steel inside and satin outside. Each mixing bowl has a pour spout and has a cup and quart measurements marked on the inside of each bowl. Set Includes: 5qt mixing bowl, 3qt mixing bowl, and 1.5qt mixing bowl. Weather doesn't matter - enjoy your favorite grilled foods any time of year with the Chefmaster(TM) Smokeless Indoor Stovetop Barbeque Grill. 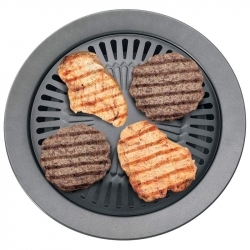 This 12-3/8' grill featuring iron plate easily grills on standard electric, gas, or propane stoves. 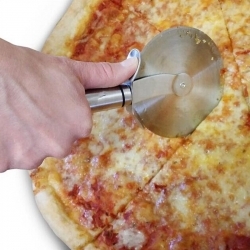 The water-filled outer ring catches fat and juices during cooking, eliminating smoke and splattering. 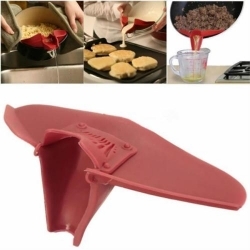 The high-quality non-stick surface ensures easy cleanup. Limited 2 year warranty. Buy two - one for the patio and one for the camper. 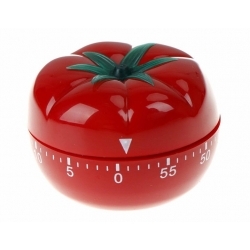 Gift boxed for all the cooks on your holiday shopping list! 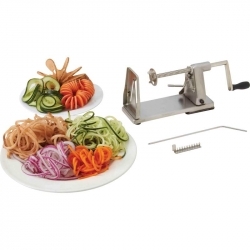 Create dazzling dishes with this stainless steel spiral slicer from Maxam(R). Try a new twist on spaghetti by making vegetable spirals to use with your sauce instead of high-carb pasta. Make enough old-fashioned Suzi Q's in minutes to feed the entire family. Easily create vegetable garnishes for your favorite dishes. Stainless Steel body with vacuum base. 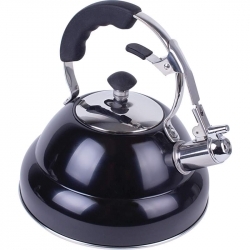 Features razor sharp stainless steel blades, chrome-plated winding rod, screw-on handle and 3-prong extension. Measures 10-5/8' x 4-1/2' x 2-7/8'. Gift boxed. 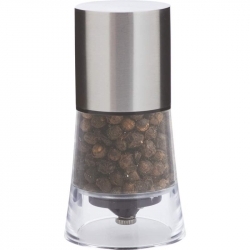 Grinds salt, pepper or any dry spice. Features twist-action top with adjustable coarseness. Measures 2-1/2' x 5'. White box. 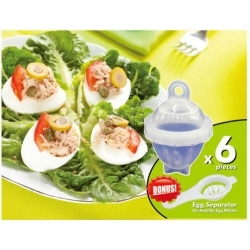 Egglettes Cooks Hard Boiled Eggs Without Shells. Notes: It Is Suggested To Use Tongs And/Or Oven Mitts To Remove From Boiling Water And Always Use Caution When Handling Hot Products. For Optimal Results, Lightly Spray Each Cup With Cooking Spray Or Coat With Any Cooking Oil. Pour Out An Excessive Oil. Before Boiling: Fill a Pot With Enough Cold Water So That The Pod Does Not Touch The Bottom Of The Pan. It Is Best To Always Hold Your By The Rim As To Avoid Burns. Are Intended For Adult Use Only. Snackeez is the all-in-one, go anywhere snacking solution! 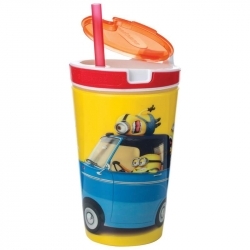 The Snackeez JR travel cup has a clever design that lets you have an 8 oz drink and hold your favorite snack all in one hand. Seals perfectly to keep snacks fresh and prevent spills. Snackeez JR is dishwasher safe. Minions theme. 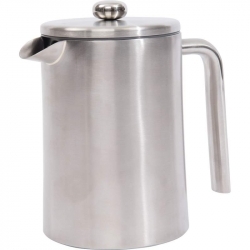 Amaze your friends and brew coffee right at the table with the Wyndham House(TM) 1.2L (40.5oz) Double Wall Stainless Steel (304) French Press. It's easy to do, and word is a French Press makes the best tasting coffee in the world! Tea lovers, take note, a French Press will also make an excellent cup of tea. 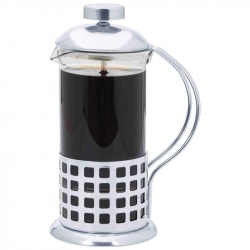 The Wyndham House(TM) French Press features stainless steel construction with an elegant brushed finish. Holds 40.5 ounces or 5 cups - plenty for breakfast and to fill the travel mugs for the work commute. Retains heat to keep your brew warm, dishwasher safe. Gift Box. Turn the atmosphere of your kitchen into a French Caf' every morning with the Wyndam House(TM) French Press Coffee Maker. Relax with a croissant, sit back, and let every sip of coffee fill your mouth with exquisite flavor. The Wyndham House(TM) French Press Coffee Maker makes the best tasting coffee! Delightful for making a divine cup of tea, too! The French Press method is known the world over as the best way to brew coffee, and it is so easy to do! 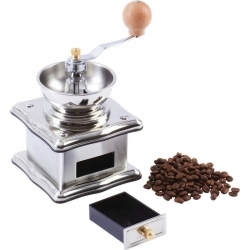 Put on a show and brew coffee for your guest's right at the dining table. Add coffee grounds and hot water to the press; let the mix steep for a few minutes. Hold the lid as you slowly push the plunger down. The filter screen will force the ground coffee to the bottom of the carafe, serving up a delicious and aromatic cup of coffee (or tea) every single time! This French coffee press will brew 20 oz. (600 ml), or approx. 2 mugs of coffee. You can have great tasting coffee or tea, brewed to your taste in a few minutes, any time of day! The clear glass carafe is dishwasher safe and heat/cold resistant. The plastic liner attached to the interior lid keeps the lid from getting too hot, and is designed so coffee oils wash easily away, leaving no residue build up and no chance of a stale cup of coffee. The carafe frame holder features a stainless steel design finish that is both elegant and stylish. The perfect gift for coffee or tea lovers, the Wyndam House(TM) 20oz French Press Coffee Maker comes in an elegant gift box. The Wyndham House(TM) 13.5oz (400 ml) Porcelain Tea Steeping Mug is a complete package for the tea drinker - just add a teabag! 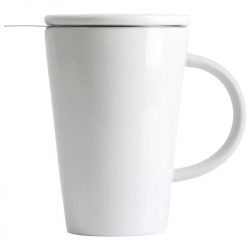 Crafted from all-white porcelain with a white porcelain lid that can also be used as a coaster. Tea mug holds a generous 13.5 ounces. Stainless steel tea strainer/infuser included. Great gift idea for the tea drinker in your life! Gift box. Diamond Cut(R) Multi-Purpose Kitchen Shears features nut cracker and a bottle or jar opener. 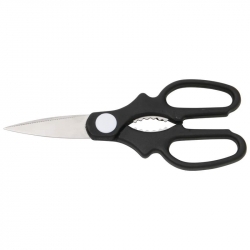 These 8" high-quality stainless steel shears are dishwasher safe. Limited lifetime warranty. Carded. Superior tasting coffee is only moments away with the Wyndham House(TM) 12oz French Press Coffee Maker. 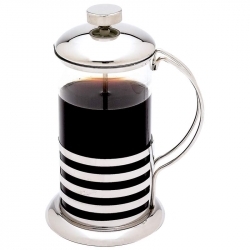 Perfectly sized to make your big double mug each morning or to create a nice after dinner treat for two, this French press coffee maker features stainless steel design, high boron glass, and mirror finish. Heat/cold resistant. Dishwasher safe. Measures 4-3/4' x 7-1/4' x 3-1/2'. Gift boxed. 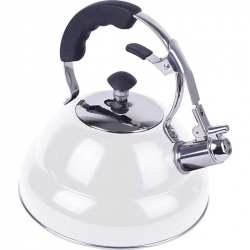 Constructed of high-quality 18.8 stainless steel with a copper capsulated bottom, the Chef's Secret(R) 2.6 liter Gloss White Stainless Steel Tea Kettle is designed for quick, even heating. The white gloss exterior finish blends well with any kitchen d'cor, and is accented with a black handle and black cap knob. The 2.6 liter (11 cup) capacity will heat enough water for a crowd in mere minutes, and whistle to alert when the water is boiling. White box. 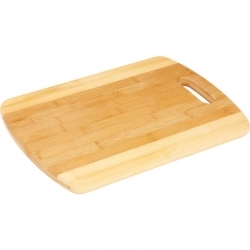 Replace your worn and possibly unhealthy plastic or wooden cutting board with the HealthSmart(TM) Granite Cutting Board. 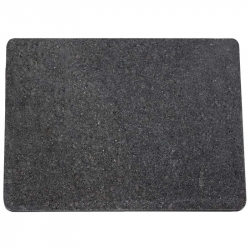 Sleek and sophisticated, the polished gray and black colored granite construction features easy clean up between food prep chores. The solid granite construction will last through a lifetime of kitchen tasks! Rounded corners. EVA feet for secure grip on countertop or table during use . Measures 15-3/4' x 12' x 1/2'. Gift box. Features hanging/carrying handle, tri-ply, cross-laminate construction, and hand crafted design from bamboo sheath. Bamboo is the sustainable 'green' durable wood product. Measures 13-3/4' x 9-3/4' x 3/4'. Constructed of high-quality 18.8 stainless steel with a copper capsulated bottom, the Chef's Secret(R) 2.6 liter Gloss Blue Stainless Steel Tea Kettle is designed for quick, even heating. The blue gloss exterior finish blends well with any kitchen d'cor, and is accented with a black handle and black cap knob. The 2.6 liter (11 cup) capacity will heat enough water for a crowd in mere minutes, and whistle to alert when the water is boiling. White box.